There have been no words from our end lately, and it would seem like we've abandoned ship. Well, on the contrary, we've been manning the ship, and this ship(Knacksteem) is still sailing. We have been quiet, but, have been working tirelessly behind the scenes to ensure we deliver the best services to you. As you know, Knacksteem has been around the Steem blockchain for a while. We have been working silently in creating a decentralized system, with the potential of changing the sphere of talent for good. One of our major goals has been to empower all individuals that we can reach on the blockchain and beyond. We understand how difficult it can be for talented individuals to get their talents publicized. This was one of the reasons that stirred up the idea and creation of Knacksteem. We are creating a home for everyone, hope for better days and solutions to quick visibility of talent of every individual on our platform. But, we are not stopping there. We decided to do more, by not only creating a platform to showcase talents but, also reward these individuals. This is what we have been working on, and its a pleasure to say that a lot has been achieved so far. 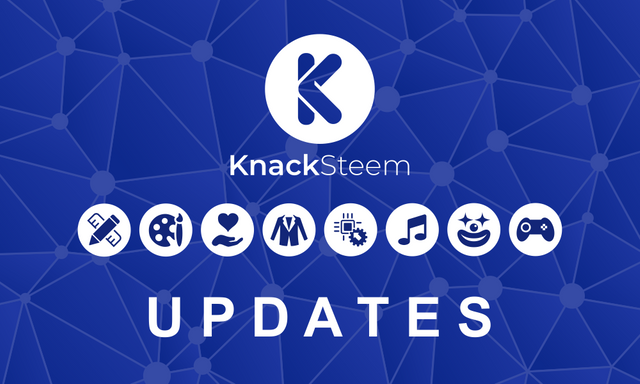 Last month, we published an article, where we made an announcement about two major components of Knacksteem. That is, the "KnackStore" and "Knack Tokens". We are very excited to announce to you that, "Knack tokens" (The official token of the Knacksteem project), is now live. Aside from that, a lot has been done on the platform since our last update announcement. You will find out about these latest updates in this announcement. Here are the recent updates that have happened since the last announcement we made a few months ago. We are happy to announce that knacktoken distribution is now live and being distributed to both our SP delegators and contributors. We appreciate all our current delegators for their trust in the project. Thank you all! We hope to get more amazing support from the community. To view your KNT reward, navigate to your profile page by replacing “username” on the following URL: https://knacksteem.org/@username with your username. We successfully integrated the voting slider with the upvote/downvote function. This will allow users to easily scale the reward % they wish to upvote/downvote a post with. We also ensured that this functionality is not restricted to any user based on SP or other metrics. This feature is available for anyone and everyone, and it is responsive across multiple devices. We sincerely apologize for the time it took to make these guidelines available. The reason for the delay was to ensure that the guidelines were straightforward and easy to comprehend. We created guidelines for all categories on Knacksteem. These guidelines are to help you create, and, publish your contributions on our front-end. These guidelines are not only useful in creating your contributions but will also give you insight about a category. The sponsor's page is another area on our front-end that was improved. Prior to this update, the page was empty. But, not anymore. With this update, the page displays a full list of our beloved delegators in a hierarchy format, according to the amount of SP delegated. The implementation of FAQs on our front-end is another update that happened. Inasmuch as we are striving to ensure that our platform is easy to use, we understand that you might still encounter some minor problems. That is why we have taken the time to compile a list of probable questions you might ask, or issues you might face, with their respective answers. This will not only make our platform easy for you to operate, but it also eradicates the need to reach us concerning minor issues. If there's an issue you want more clarity on, then you can reach us via any of our means of contact. The search feature searches and return result for both similar post and user matching the word searched. This allows you to query contents according to your niche. We are not resting on our laurels after this update. There are lots of things to be done. Most of which will bolster user experience and encourage contributors to make use of our platform. These are the features/functionalities you should be expecting in the next update. We might decide to work on bringing in more features in the next update. All these features will be made very flexible, and of course, easy to use. Great news! for sponsors and contributors on Knacksteem. Recall that in our previous publication, we announced that we were cooking big things for our sponsors and contributors. Well, the meal is ready and is currently being served. The distribution of Knacktokens is currently on, and you don't want to miss a chance to become a major holder of these tokens. You can get these token either as a sponsor or a contributor on Knacksteem. SP delegators as we like to call them, are entitled to this token distribution, in addition to the 12% beneficiary reward from all the posts made via our front-end. This 12% beneficiary is distributed pro-rata to the amount of SP delegated. Another 3% is reserved to reward the team. Here is a simple illustration of how this token is distributed. 10 million KNT is reserved for @knacksteem.org SP delegators in which 100,000KNT will be distributed to SP delegators daily. This will be distributed according to the share of SP delegated to the knacksteem official Steem account (@knacksteem.org). In more detail, @knacksteem.org currently have 8,218 delegated SP. If a user, let’s say @bob delegates 1000 SP to @knacksteem.org, this is how @bob’s share will be calculated; 1000x100,000KNT/8,218= 12,168KNT. This is calculated as Amount delegated x The total KNT share on daily basis/The total delegated SP to @knacksteem.org. This means @bob will get 12,168KNT daily. While this may seem huge, the number will scale down as we get more SP delegators which is a good thing, as this will cause the value of the token to rise due to demand. However, the more SP a user delegate, the more KNT they get. Why not become an early bird, delegate some steem and become a Knacktoken holder today!!! While we are still attracting more SP delegators, here are our current delegators. We appreciate you all, and thank you for supporting this project! Contributors will receive Knacktokens for contributions that must have undergone the evaluation process either by a moderator, or, a supervisor. Here is a simple illustration of how this token is distributed for contributors. A contribution will be scored according to its quality. from 0-100. Each user can earn 250KNT (KNT represents knacktokens) max on a contribution. To calculate the amount of token earned in a post, we calculate; Value of contribution scorexKNT max per contribution/the max score a contribution can get. Let's say your contribution got 30 as contribution score, the calculation would be 30x250KNT/100=75KNT. Upvote value or percentage may vary across knacksteem categories. We don't think this information would be new to you. Except of course you are just hearing about Knacksteem for the first time. This project has blossomed via collaborative development, which is only possible because it's source code is open. We want to use this medium to implore you to make contributions towards the development of this project. You can find here the project front end code and here for the project API code. Feel free to fork and make pull requests if you want to see any improvement. You may also submit ideas and bug-reports to our repository by simply opening an issue. Please note that we have a contribution guidelines in place and you are advised to go through it before making a PR. Do you have a talent? Are you able to reach your appropriate audience with what you can do? Are you getting monetary value for your knack? If no, Join knacksteem! 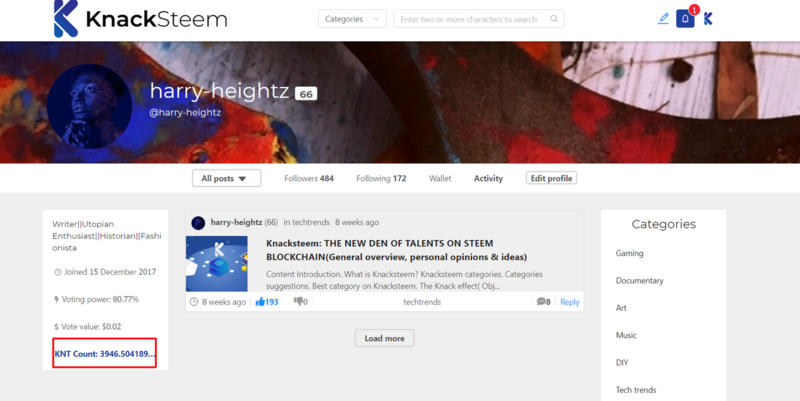 Knacksteem is a community for talented individuals. Why not join us today and share your amazing talent to over a million prospective viewers. You can get in touch with us on our Discord server. You are welcome to leave your concerns, questions, or queries as a comment on this post. This is, quite clearly, a huge update, and one I am happy to see. Knacksteem's looking very good, and it's impressive to see the strides you've made in the past few months. I am especially happy to see the guidelines. As you know, I'm a big believer in the importance of strong guidelines in creating a great content-based community. One area where I would push you to work on improving is the clarity of the writing. Some of the sentences were a bit unclear, a bit ungrammatical. I strongly feel that using shorter, clearer sentences would help you deliver your content in a way that is more impactful. That said, the text was definitely easy to understand overall. I push for improvements because I believe our Blog category can be a bastion of good writing, not just great information. I'm glad to see this awesome post. Truly, it's time for us to start showing our skills and talents. Now that knacktoken is live and ready for distribution, Steemians would love to be a part of the progress. That said, I think I love the integration of the voting slider. Especially it's functionality. The fact that anyone can use it irrespective of their status on steemit is wonderful. The created guidelines would really be of help to all existing and potential contributors. It would serve as a guide for anyone trying to use the platform. However, the created FAQ cut across every areas, and all intended questions are already answered. Great work. Looking forward to seeing the platform boom. We are Knackians. Thanks for the nice words @ckole and, stay tuned for more updates. Congratulations @knacksteem.org! You received a personal award! Oops! We've updated the post with the correct name. Thank you for pointing that out and thank you for supporting the project. You just got a 5.17% upvote from SteemPlus! All great, but a login is not working. Hi, @aschatri. I could not reproduce this behavior. Please kindly create an issue here with enough information to help us reproduce and we will try to fix it as soon as possible. Just a heads up to say I think your sites certificate has expired. Would you please let us know which of the links are not working? We will try to fix them as soon as possible. Thank you.